Rick Harder: There's No Place Like Mayo! Certain cities are known for greatness. New York: Broadway Plays. Vegas: Gambling. Paris: Romance. Rochester, Minnesota is home to the world's best medical center, Mayo Clinic. We spent 14 months visiting several doctors and undergoing many tests in Oregon, but still did not know the cause of his symptoms. Then came Mayo Clinic. In December of 2008, our dear brother-in-law, Dr. Dave Dedrick, became our primary doctor. Prior to this, we had no advocate. He sent us to The Mayo Clinic and in four days, Rick had a diagnosis that made sense. Additionally, Rick was immediately placed on the liver transplant list. It was expected that the wait would be 6-8 months. In total, we waited only 4 months. Mayo Clinic was the answer. 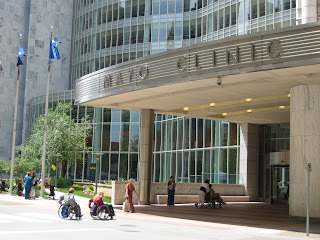 We have been so impressed by the efficient, passionate, and professional service of the Mayo Clinic staff. Throughout the experience, we knew that we had arrived in the world's best city for Rick's medical care.